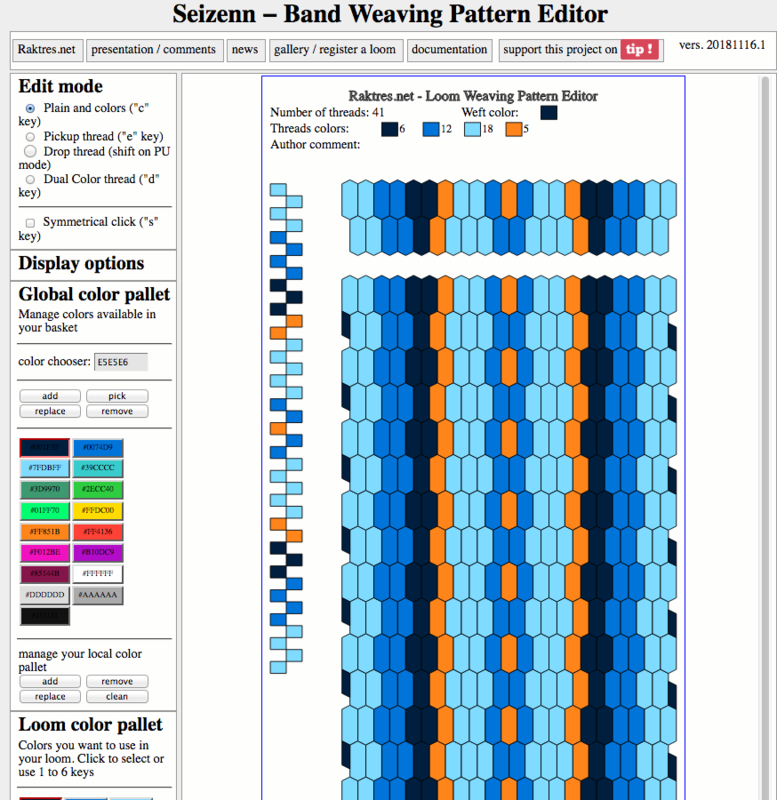 Just select a color on the “loom color pallet” and clic on the pattern. “pick” get the selected color into the color chooser. You can then adjust it and use the “replace” button to save the change. loom pallet: just select from the global pallet the colors you want to use for your pattern. Use “add”, “remove” and “replace” buttons to take a color from you global pallet into the loom pallet, remove it or do a swap. “rotate” and “shuffle”: to permute colors used in the pattern. “symmetry”: just replicate the left part of the pattern on the right part. To save a pattern, look at the “export” panel on the left. You can use a short link to share you pattern. The «save» button create both a short link and a VisualCode. To create a PNG picture of your pattern, use the «create PNG» button. Be sure to update first the short link (if needed). A new picture is visible on the central bloc or you can just click on the link “link to png”. In progress project. Look at posts for last news. Feel free to send comments. How do i save the program to use offline? Awesome program by the way. First, open the editor and use the “save” function of your browser (menu “File”/”Save as” or something like that). Choose the location on your computer, the name of the file (for example “pattern_editor.html”) and select the option “Webpage, Complete”. Once offline, just open the file (double click on the file or, in your browser, use “file”/”open”). What a wonderful tool! But I have some questions. 1. Is my global color palatte limited to 8 colors? 2. Is there a way to make an account so my colors are saved? 1. There is no real limit for the number of colors in your global pallet. You can follow this link to see an example with 50 colors (quite sure it will not work with 2000 colors…). 2.For the moment it is not possible to create an account. I wasn’t sure it would be useful. Moreover the tool is created to work offline, an account would imply a link to internet. The solution I offer now is to save the link to the pattern. On the left column, in the “Export” panel, you can find a link to create the pattern again. Save this link somewhere (in a mail, notepad…). Just start you new project using this link. An account could be a future evolution. It’s now possible to register. You will soon be able to share your patterns, maybe your pallets. Feel free to present your expectations. Merci. This is a wonderful too. It is easy to use and I love it. I was able to save a pattern, but am wondering about saving the linear table, and the number of warp threads? To save a picture of the pattern, the first idea was to print the page (for example in a pdf file). The result is not really good. I understand that you prefere to use the “create png” button. I will consider improve this feature.